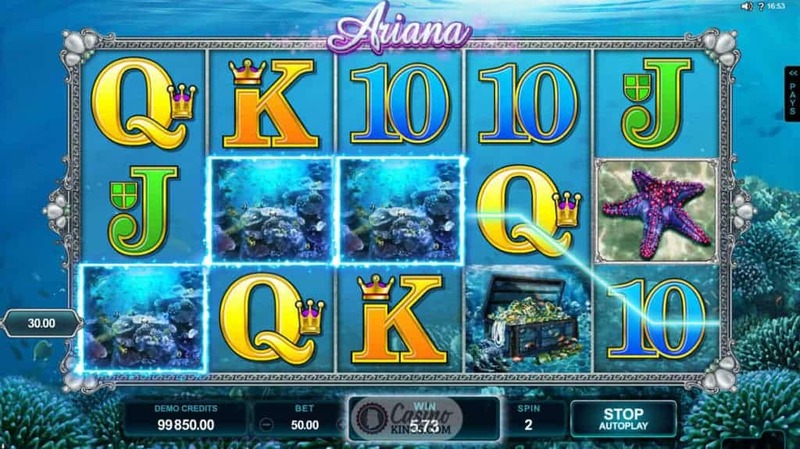 Ladies & gentlemen i present to you the wet and wonderful Ariana Slot game. What’s not to like about a mysterious half-naked underwater princess that bestows riches upon adventurous seamen? Even Walt Disney found it too much of an attractive proposition to avoid. 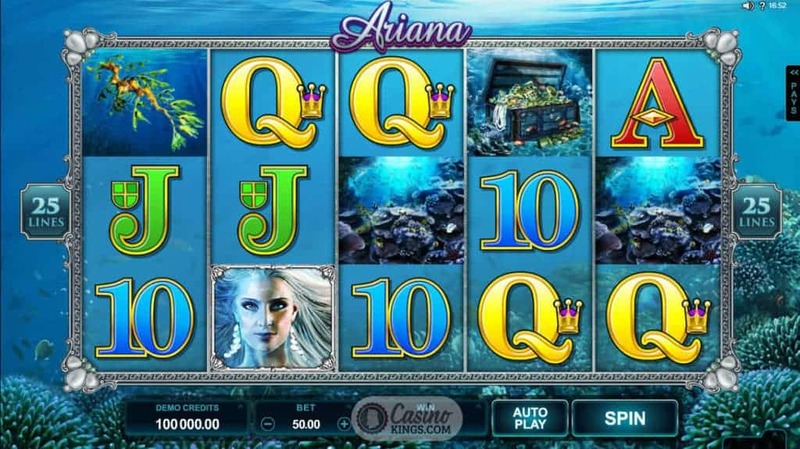 And Microgaming have come up with their own version, Ariana, dressed only in a glittering bikini and possessing the power to expand Wilds across these five reels. This girl’s a keeper. So, what can we expect from Ariana this underwater paradise? Coral? Naturally. Treasure chests? Of course. Scattered Starfish? Beautiful. And all contained in a reel case of such ocean splendour that it makes you want to head to a travel agent with your winnings and ready your snorkelling gear. We play on 25 paylines, which makes the minimum bet €/£/$0.25 and for all the sub-aquatic high rollers out there a max bet of €/£/$125.00. Score a big win on an expanding Wild with maximum bet and we will soon be looking at the kind of stash that would make Ariel forget about shacking up with that bouffant from above sea level and stay down here with us. Mwahahahaha! 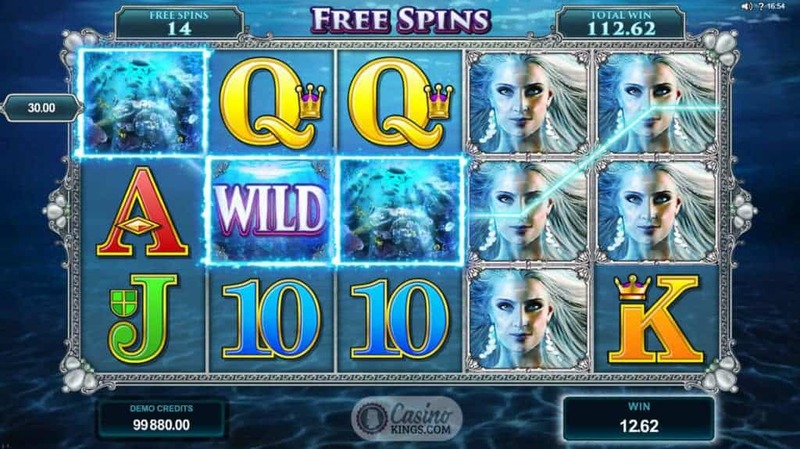 As well as the Ariana free spins bonus feature that is the real bounty of the sea Microgaming has also treated us to Stacked Wilds in both the base game and the free spins feature that have the potential to rock this underwater casbah right to the reels. Any full symbol stack on Reel 1 expands all matching high symbols on the remaining reels, as long as those matching symbols form part of a winning combination. 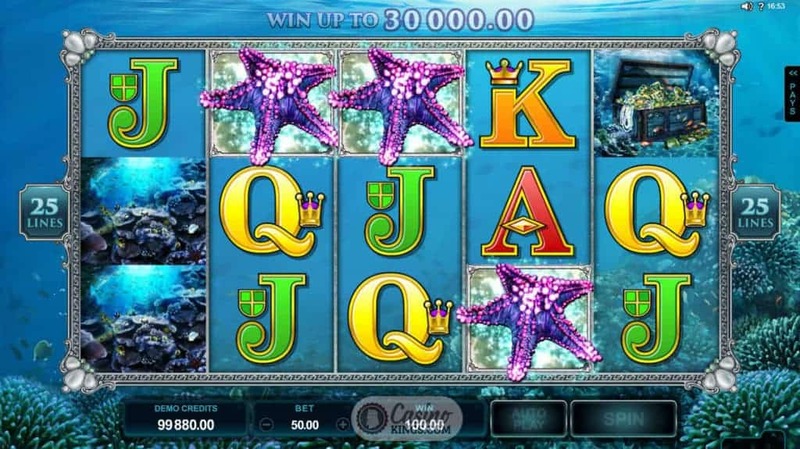 During the free spins feature, triggered by landing three or more of our glittering (not chocolate) Starfish Scatters, any full symbol stack on Reel 1 not only expands all matching high symbols but also the Wilds on the remaining reels. Again, the matching symbols only expand when forming part of a winning combination. There will inevitably be those moments when you see the full symbol stack on Reel 1 land and nearly leap out of your chair before you realise that they don’t form part of a winning combination, but boy oh boy when they do…well, you’ll need a wetsuit for other reasons. The graphics in this game look outstanding, placing us perfectly in this underwater theatre with our beautiful maiden of the game’s title. It is a shame that the sound score doesn’t match the sumptuous graphics in the base game, though it more than comes to life in the bonus feature. In truth, it is the bonuses that ultimately make this game one to be played and enjoyed.